The "Year of Change" (aka 2007) is finally over - or it will be in about 12 hours. Next year has already been christened the "Year of Home and Health." Our new house needs A LOT of work and instead of spreading it out over years and years, we would like to have it all (or mostly) done this year so we can enjoy it later. The "Health" portion would be Eric joining a gym and me cleaning out the junk food and keeping us on the healthy straight-and-narrow. I'm glad this isn't starting until tomorrow, because there is a box of Twinkies on the counter that I HAD to have last night and that is already 1/2 gone. Along with the Twinkies, my delivery boy brought me matching flowers (they matched the Twinkies). It's nice to have a live-in deliverer. It's going to be a busy year - someday I might be able to rest even when I'm not sick! Have a wonderful New Year - and keep commenting on this lowly blog! I am sick. This is the fourth day of my sickness and I seem to be getting worse instead of better. Strange things are coming from my nose (I know, it's gross to think about). The only thing I had energy to do today was bathe the dogs - and that was only because I couldn't stand their stench any longer. My stamina for blogging is even waning at the moment - I'll try to update later. This holiday season is really draining! I think I'll try to cut down next year. Off to rest again. 2007 was christened "The Year of Change" in my household. I love change! I would change my furniture placement every day if I had the energy! Sometimes ordinary is good - my kitchen a cupboards must always stay the same - but sometimes change for the sake of change can be better. Try a new recipe - try a new hairstyle - or just listen to some new music! Other things are harder to change - friendships, family relationships, your own personality or attitude - but it's worth the evaluation every once in a while. Do you need to make a change? Are you living with "normal" because it's just easier? Do you need to take the huge, courageous step to move out of your comfort zone down an unfamiliar path? (Many cliches - one sentence) I have done a few "out-of-character" actions over the past week. I said no, I introduced myself to a complete stranger, I gave myself permission to accept a situation (instead of stewing over it) and I realized I don't have to like everyone AND they don't have to like me. I have also started school for the fourth (and final) time. So, take a chance - do something crazy! Make this your day, month or year of change! Usually the question of marriage is bypassed - probably because I'm wearing a beautiful ring on the fourth finger of my left hand (or third finger, depending on what your definition of "finger" is). But the inevitable question after "What's your name?" is "Do you have any kids?" Now, I should be used to and ready for this question, right? It shouldn't irk me that a "well-intentioned" stranger wants to keep a conversation going by opening the way for detail-laden descriptions of labor, delivery, teething, diapers and illnesses, should it? But it does. Now, I love kids! Really - I think they're cute, say the darndest things and look like angels when they sleep. But, we don't have any. I usually respond with a laugh: "No, we have two dogs!" Even though they don't say the darndest things, they come close to kids on all other counts. (Please don't comment and say 'They don't have souls' or 'Do you think dogs are equal to humans?!?!' because I know we as humans are made in God's image and that dogs are only companions.) I love my dogs - Eric and I constantly comment (as we sit in the living room at night with dogs draped on us and the furniture) on our family and how nice our dogs are. Now, we are not "Mommy" and "Daddy" and the dogs are not our "kids" but we are a family, nonetheless. I wonder if I should tell the questioning public that we're content in our childlessness right now - that it doesn't mean we always will be, but for now, we're trusting God with our fertility. I wonder if they need to know that we've taken all the tests, looked at all the "normal" results and then my husband and I say "Well, it must not be time yet." Do they care that I don't want strange drugs pumped into my body and even stranger procedures performed on my husband or myself? Will they be shocked to learn that we're not ready to adopt even after being married for seven years? If these people could get past their feelings of "Hmm.. I wonder what's wrong with them?" and ask me how this has affected our marriage, I would tell them: This childless time has given us a chance to really know each other, to grow together and to look at our life situation through very clear (and un-sleep-deprived) eyes. We haven't struggled with parenting together, but we've grown through other life lessons. We talk about the abstract idea of children alot and would be thrilled if a little Eric/Katie blend ever came along. But, we're also trusting God's plan for us - which seems to be a little different than most other people's. ("For my thoughts are not your thoughts, neither are your ways my ways," declares the LORD. Isaiah 55:8) I feel a little sorry for those people that hope the "Kid Question" will bring about easy conversation - but my advice is, try to know your childless friends for who they are and not just for what situation they are in at the moment. This has been a hard lesson for me to learn. It's easy to focus only on differences or similarities in a relationship and forget that people just need people to be there for them - even when they're at different stages of life. So, when you look at my blog name, remember, I'm more than just a married girl with two dogs - but then, aren't we all? It feels strange to be in Omaha - we've been holed up in The Tiny House for a month - and we've only been here 7 weeks! The day before Thanksgiving, it snowed and got cold. 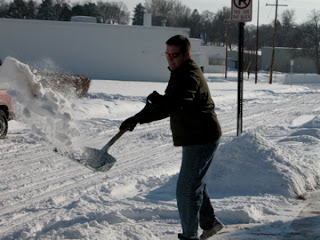 Since then, we've have more snow/ice every week - sometimes twice a week! So, although I love the house, it feels weird to be so unconnected with the neighborhood. I still have to read street signs and count down numbered streets to get places. I also feel myself comparing distances here to their equivelents in Lincoln. Driving is easy but I still don't know where anything is. I've been using the internet ALL THE TIME to find locations for places I could just drive to without thinking in Lincoln! :) I've promised to post pictures chronicling our last few weeks and our house setup for certain friends! (Here they are guys!) Enjoy! 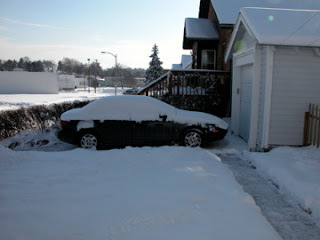 Our Most Recent Snowfall - 5 inches! The big white building in the background is home to one of our most considerate neighbors: Certified Transmission. They keep their property nice and clean and are very quiet in the evening - although that may be because they're closed after 5pm. 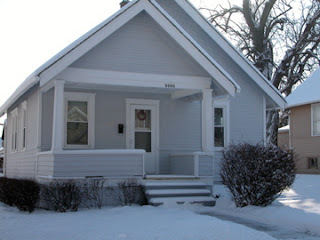 Our house in the snow - doesn't it look cozy? 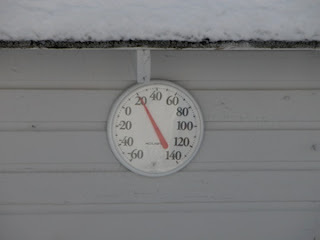 This was the high temperature for the day - getting up the nerve to go outside has been tough for me! 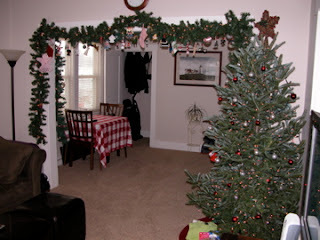 The view from the front door - notice our very little Christmas tree in the corner - it's soft and has only glass balls and lights this year - our ornaments are gracing the garland in the doorway! Our stairway doubles as a coat closet and vacuum storage area. This house has only one closet which is packed full of clothes and shoes. We've had to come up with creative ways to store all our stuff. If you see something that may work better, let me know! (The Kitchen door is next to the piano. And the piano is decorated with Christmas Decorations and Christmas Music!) The Temporary Bedroom - it will soon be an office/guest room. The view of the bathroom from the bedroom - yes, you have to walk through the bedroom to get to the bathroom - a little awkward, but it works for now! The Kitchen viewed from the Dining Room (the Living Room is at your right and the stairs upstairs right behind you to the left) Look at the SUPER TALL kitchen cabinets! I think I actually have storage room to spare in this kitchen! Check out the really old-fashioned sink! I love the look of the sink - although it would be more practical as a laundry room sink. One basin makes washing and rinsing a bit of a problem. It's teaching me to wash RIGHT AWAY - something I hate to do, but I'm learning. Note the empty sink! :) I just realized how much of a camera hog Sadie is! She's in quite a few pictures! (But in this pic, she's trying to get her ball by the stove.) (And right now, Sadie is keeping my lap very warm by laying her very large head on it!) She's a good dog! The Double-Black-Diamond stairs to our basement - try to navigate those without skis and holding a laundry basket! Laundry Room - my 2 favorite features: the super long counter top for folding and the hanging bar for all our clothing that doesn't fit in the only closet! The future master bedroom and bathroom! The bathroom will (hopefully) be at the far end of the room and the bedroom will be the rest of the entire upstairs. Eric and I are very excited to get started on the upstairs renovation. I hope you enjoyed the tour! Merry Christmas everyone! Many things have changed in the last 6 weeks. 2. We sold our Lincoln house. 4. I'm washing dishes by hand again - it's been a long time! 5. I've moved from having a temporary job to having no job at all. 7. Our church family is still out there somewhere, we're just not sure where. 8. Eric and I actually had time to decorate for Christmas this year...together! 9. I feel stir-crazy from having SO much free time on my hands! 10. The dogs have gone into hibernation mode - it's great! 1. Why would I do this to my poor dog? 2. Baking Christmas cookies is not nearly as fun as it sounds. 3. The tiny snow pellets ping against the sidewalk. 4. My 50 pound pet thinks she's a lap dog. 5. I wish I was young enough to play with paper dolls. 6. Sometimes just getting motivated to get dressed is a chore. 7. I miss playing violin - although I was never very good. 8. Christmas trees should only ever have white lights. 9. Snowmen are my favorite holiday decorations. 2. Why is it so easy for everyone else? 3. Dishes are the bane of my existence. 4. I love my dogs! 5. Friends are hard to come by - and even harder to keep. 6. I hate the phone: hearing it ring, talking on it and remembering to charge it at night. 8. Christmas lights make me extremely happy - you could say they make me giddy! 9. I want snow flurries every day all winter long. 10. I've wondered if giving up would be easier? 11. A new pillow is the best way to sleep easier. 12. Paper clutter is my nemesis. 13. I love taking pictures but wonder why I don't take more. 14. There are too many options in life. 15. Autumn leaves are beautiful: their sound, their smell and the colors they become. 16. Trite cliches disgust me. 17. If it's not working, end it! This has been a strange day. I attended a funeral this morning and talked with an old friend. Besides being encouraged, I was also grieving for the family and the loss of a very special man. Driving home, I took a detour to apply for a job. As I walked to the door, a man screeched to a halt in front of me with a red sports car. He jumped out saying, "There's been a shooting, the malls are closed down!" I turned and headed to my car - the news about the shooting was on the radio. Thankfully, the shooting was at a different mall. But, it has been a strange day.